Debut novel Neon In Daylight has been heralded as a modern New York City novel like The Great Gatsby or Bright Lights, Big City. 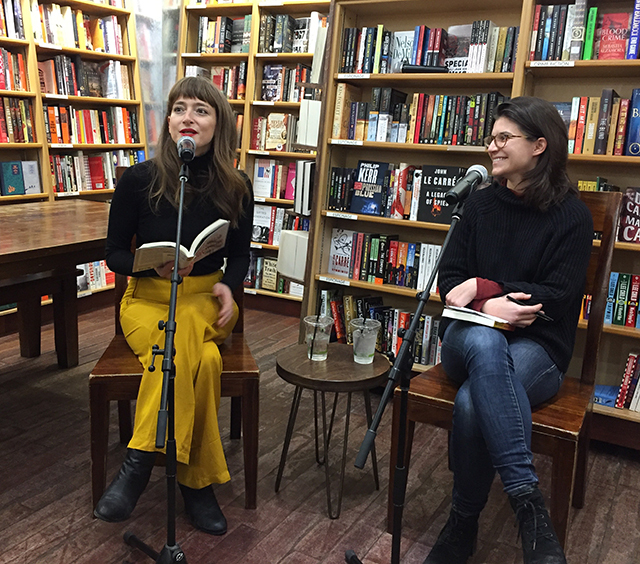 Hermione Hoby was at McNally Jackson Books to discuss the novel with Dayna Tortorici, coeditor of n+1. The novel follows Kate, a young woman just arrived in New York City, meets Bill, a charismatic but has-been author, and his daughter Inez. Hoby says that with with crafting her writing, she often feels there is rarely an intention–that is, the writing just sort of happens and she has to go with it. Kate has an infatuation with Bill and Inez not because there they are people she should be interested in, but because the experience of a person’s twenties is often irrational. New York City is so important to the novel seemingly by accident. The intensity of the city, the concentration of it with thrilling architecture–skyscrapers thrusting upward and surrounded by water–demands attention. New York is constantly new and changing, and, as Hoby says, unsentimental in many ways about it’s past. “The world doesn’t need another New York novel,” she adds. She reflects that she would have preferred to set it someplace else if she felt that she could and wouldn’t choose to write about a place that has been romanticized the way New York has–but it’s never really choosing. The fiction finds itself. “Bill was like, ‘I’m here,’ and I couldn’t do anything but write him,” Hoby says. Bill is also the character Hoby shares the least biographical information with, she observes. The novel began in a Park Slope cafe six years ago. It was a highly inefficient process, Hoby says. The novel made writing journalism easier though. It was something that was entirely hers, and because of that, writing fiction was terrifying, especially since a lot of the journalism she writes is formulaic. “Every fucker in Brooklyn is writing a novel,” she says.